Perkins V: How can states design meaningful accountability systems? With the passage of the Every Student Succeeds Act (ESSA) and the Workforce Innovation and Opportunity Act (WIOA) within the last five years, states have been looking at how to measure career readiness and the effectiveness of programs. Importantly, the Strengthening Career and Technical Education for the 21st Century Act (Perkins V), shifts the accountability indicators at the secondary and postsecondary levels and provides an opportunity for states, in consultation with stakeholders, to select an indicator of secondary “program quality”: work-based learning, postsecondary credit attainment or credential attainment during high school. As states begin to look at this indicator and design their accountability systems for Perkins V, how can they ensure these measures are high-quality and aligned with measures of success across workforce and education programs? Check out the resources below to learn more. 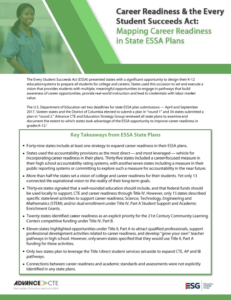 REPORT: Career Readiness & the Every Student Succeeds Act: Mapping Career Readiness in State ESSA Plans: This report examines how states are taking advantage of key opportunities in ESSA to support career readiness, including how states address career-focused measures in their high school accountability systems. Watch a related webinar here. REPORT: Destination Known: Valuing College AND Career Readiness in State Accountability Systems: This report from Education Strategy Group and the Council of Chief State School Officers provides a roadmap for the measures states can use in an accountability system to support all students in achieving success after high school, as well as strategies for putting that accountability system into practice. Ohio: CTE Report Cards discusses how the state integrated career readiness data into a CTE-specific school report card. Washington: Student Achievement Initiative Funding Formula outlines the state’s efforts to encourage institutions of higher education to prioritize student success. CHART: This document compares the secondary and postsecondary indicators of performance in Perkins IV and Perkins V, and points out alignment with performance measures from ESSA and WIOA. The next issue of this series will include resources on stakeholder engagement and in the meantime, please be sure to check out the Learning that Works Resource Center. This entry was posted on Thursday, January 31st, 2019 at 2:26 pm	and is filed under Uncategorized. You can follow any responses to this entry through the RSS 2.0 feed. Both comments and pings are currently closed.